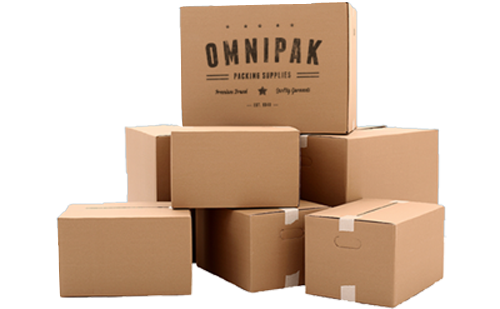 Over 1600 standard stock sizes of Corrugated Cardboard Boxes for Shipping, Mailing, Moving, and Storage. What Are Corrugated Cardboard Boxes And What Is Their History? The patent for corrugated cardboard came from England in 1856. 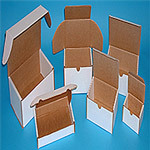 Corrugated cardboard boxes have been made of paper. They have a piece of paper that has been fluted and this is placed in between two flat liner boards. 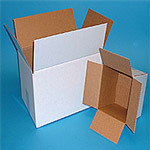 Because of this construction, corrugated cardboard boxes are a lot thicker, making them a lot more durable. 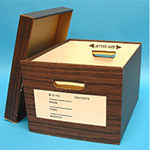 These types of boxes are mainly used for shipping in today's day and age. Another name for corrugated cardboard is pleated paper. When it was first developed, it was supposed to be a liner for hat boxes. In the mid and late 1800s, tall hats were very fashionable but could easily be damaged in transport. This led to the creation of corrugated cardboard. 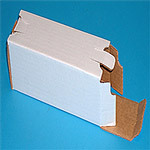 As stated, the patent for corrugated cardboard was issued in 1856. However, it took another 15 years, until the 20 December, 1871, for a patent to be issued for corrugated cardboard boxes that were specifically used for shipping. This patent was issued to Albert Jones, a resident of New York City. In those days, the product was used mainly for the protection of glass lantern chimneys and glass bottles that were shipped between Europe and America. 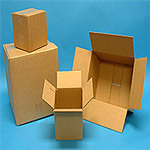 The design of corrugated cardboard boxes was improved on by Oliver Long, who added liner sheets on both sides of the cardboard. This design has been unchanged since and is still used today. By 1874, G. Smyth build a machine that could manufacture corrugated cardboard. When the machine and the new design were combined, demand for corrugated cardboard increased tremendously and it was used in more and more areas. Robert Gair made the first corrugated cardboard box in 1890, making corrugated cardboard an even more important product. It was thanks to this product that wooden crates were finally replaced. Also, the price of cardboard was far lower than the price of wood, making shipping and storing far more affordable. Best of all, corrugated cardboard actually offers more protection than wood, meaning that by the time these boxes became readily available, shipping products could be done with almost no worry of damage. The role the corrugated cardboard box has played in developing the export market should not be forgotten. So, what is the system that is involved in the manufacturing. 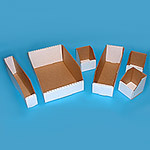 The most important part of manufacturing corrugated cardboard boxes is, of course, the corrugated cardboard itself. This is done by using corrugation machines. These machines are incredibly fast: they can create 500 lineal feet of corrugated cardboard per minute. 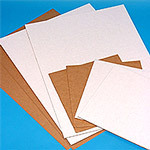 Within the process of manufacturing corrugated cardboard, the paper is first subjected to steam under very high pressure. This steam is designed to soften the fibers within the cardboard. These fibers then get bed and are used to create the thickness of the flute. The flute is what is placed between the sheets of paperboard. After that, more pressure is placed on both the top and the bottom of the material, which increases the strength of corrugated cardboard. The boards, which are then flat liner, are then brushed with glue or other adhesive on one side. After this, the corrugated cardboard is placed between two layers of liner board, in essence sandwiching it. Corrugated cardboard can come in a range of different colors, as some people prefer corrugated cardboard boxes in colors that fit their company logo. However, the most common colors are white, brown and mottled white. 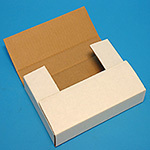 The flute within the corrugated cardboard can also be modified to be of different degrees of strength. In this country, five standard thickness levels are used, denoted by the letters A to F. Interestingly, the letter talks about when it was invented and has no direct relation to the size. In other words, F is not necessarily thicker or thinner than E.
Construction corrugated cardboard can do in a variety of different ways, although the basic process will always stay similar. The type of construction depends on the end product that is required. 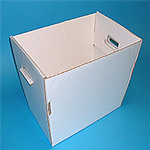 Some of the construction types of corrugated cardboard boxes include double and single wall. There is also the possibility to specify the flute sizes. In terms of strength, the edge crush strength and the burst strength can vary. Also, the look of the corrugated cardboard can vary. As stated, it can come in a range of different colors, but it can also receive a varying amount of coatings, surface treatments and coverings. It is always interesting to know the details of such an everyday product.